This is an alternative and more direct route to get to Alice Springs from Qld. It is classed as a "highway" however it is unsealed and by the looks of it, not graded very often. 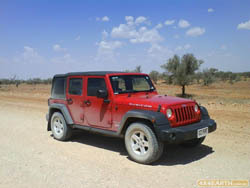 It is a good way to see the desert and to experience solitude as you won\'t see another car for hours. It is a very easy track, however it is very remote so is essential to carry a large food supply, plenty of water, spare tyres (2 is better), spare parts, and spare fuel. There is a sign at the start of the road advising you that you are entering the desert and to carry all of the above. I fueled up at Boulia but stupidly didn\'t fill my jerry cans as my map showed a petrol station at Tobermorey. Be warned...THERE IS NO PETROL AT TOBERMOREY. Looks like the two cars passing each day didn\'t warrant a servo. It is about 450km from Boulia to the next fuel stop at Jervois. Luckily we crawled to Jervois after finding out this distressing fact and all was well. We paid about $2.20 / Litre but made sure we filled our jerry cans too! You can camp at Jervois for about $5 each plus $2 if you want to use the feral shower they have. It was a welcome spot to stop however it was a hot 42 degrees and the heat was retained in the dirt all night. It is like sleeping on an electric blanket. A good way to see the outback!